21 and Over meets The Butterfly Effect. And believe me, I’m making it sound more interesting that it was. It’s not all bad. In fact, it was quite watchable. BUT then again . . . How many times have I used that old chestnut? So what’s it about? 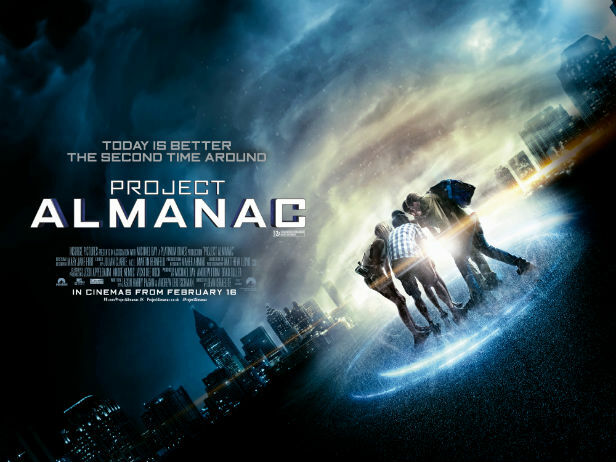 A group of teens discover secret plans of a time machine, and construct one. However, things start to get out of control. As soon as the opening sequence began with that inevitable and irritating shaky handheld camera, I sighed. However, despite the disorienting camera work, it zipped along. It established the geeky characters quickly with a humourous segment that you’d expect to see more on The Gadget Show than in a feature film. The first 20 minutes was corny but set up Jonny Weston’s David (Chasing Mavericks) as he desperately tries to earn a scholarship at MIT while dealing with trying to woo the girl that doesn’t know he exists and blah blah blah. Geeks trying to get laid and fall in love. The usual guff. David finds an old home movie of his 7th birthday party and catches his “present day self” walking in the background. Cue the rest of the movie. “So you’re telling me. Dad left a time machine in the basement”. The premise is ridiculous and full of plot holes BUT what I will commend is that the cast don’t take it too seriously. A weakness that strengthens this film and makes it a lot more fun. Stupid BUT fun. The acting is a little bland. Ironically on some of the more serious moments of the film. The guys’ breeze through the scientific mumbo jumbo as much as possible. Something about temporal relocation aided with endless time travel movie references (Terminator 1-4, Looper, Back to the Future). Oh and of course, let’s not forget the infamous Time Paradox chalkboard that magically appears in the room when the present day has suddenly changed dramatically! The film did focus another 20 minutes on the gang fixing said time machine. The geeky gadgetry sequences were interesting enough. The things you can do with an Xbox 360, huh? The material hunting wasn’t bad with our nerds breaking into their own high school to steal hydrogen. The only thing I thought was a little silly. David states to his sister to record everything. Is it a good idea to film yourselves breaking into public property and stealing expensive chemicals in the name of science? Hmmm . . . The visual effects with the time travel tests was brilliant. Mini tornadoes in water. Tools melting. Various items fusing in the walls. In total, it’s a good 45 minutes before the gang even actually time travel. Luckily it’s all easy going enough. When they do time travel, the experience is quite disorienting. The camera work did my eyes in. It does get a little corny but quite funny. The fact the gang are rejoicing that they travelled back to yesterday was hilarious. Worried about distorting reality or changing the fabric of time? Nah, all they did was accidentally steal a dog. Of course, being teenagers, they use time travel to pass exams. Sam Lerner’s Quinn was quite memorable. The numerous attempts he had to take to pass his science exam was funny. The teacher inevitably changing every question each time he travelled back. Brilliant. The lottery scene was well done. Who wouldn’t use time travel to try and win it? It was great when the gang realise they wrote down the wrong number and only (I say only) won 2 million out of a 128 million jackpot. Things do get a little more interesting when they meet their past selves. That’s where the film seems to jump start from its jittery easy going crawl. Inevitably, there are always consequences when people mess about with the fabric of time. Even if their intentions are good (or a little shallow in David’s case). Uh, no. I didn’t. A little payback was rewarding BUT it would have been nice to know why Christina was doing it in the first place. The punchline was badass though. I felt the romance subplot between David and Sofia Black-D’Elia’s Jessie was so cringey and corny. Any sweeter and I would have vommed. It’s all done with enough fun and cheesy stupidity to be watchable. The last 20 minutes does get a lot darker and frantic with the paradox effect rearing its ugly head. The only problem is that after so many classics; Back To The Future, Twelve Monkeys and Doctor Who, the same old thing has to happen. The ever predictable timey wimey guff coming to a nauseating finale (and that was without the aid of the shoddy camera work). The ending was dire. And to add insult to injury, the main character has the cheek to look at the camera with the cringiest closing line ever. Give it a go if you’re fed up of re-watching the time travel classics BUT otherwise watch the classics. If that final scene wasn’t in it, I would have caved and gave this a 3 (Just)!